Generation Y has grown up in an age of the brand, bombarded by name products. 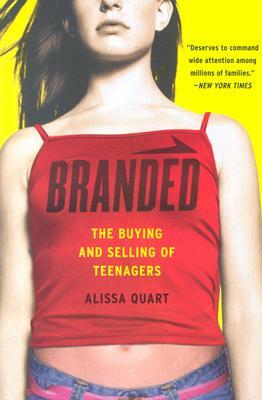 In Branded, Alissa Quart illuminates the unsettling new reality of marketing to teenagers, as well as the quieter but no less worrisome forms of teen branding: the teen consultants who work for corporations in exchange for product; the girls obsessed with cosmetic surgery who will do anything to look like women on TV; and those teens simply obsessed with admission into a name-brand college. We also meet the pockets of kids attempting to turn the tables on the cocksure corporations that so cynically strive to manipulate them. Chilling, thought-provoking, even darkly amusing, Branded brings one of the most disturbing and least talked about results of contemporary business and culture to the fore-and ensures that we will never look at today's youth the same way again. Alissa Quart is a graduate of Brown University and the Columbia School of Journalism. She has written features for publications ranging from the New York Times and Lingua Franca to Elle, The Nation, and Salon. She lives in New York City.